When you are in the market, Searching for the right portable generator for your appliances, you come across many devices claiming to be the best of the lot. The trick is to find the ideal one for your needs and situation. The Powerhorse 7000 Generator Model 750140 with 7000 Surge Watts portable generator could be the ideal solution given it’s efficiency and a range of advantages it offers. Northern Electronics manufactured it in China but it is made keeping the demands of the USA and the brand has already been tested in the US. So, what is special in PowerHorse Generator? 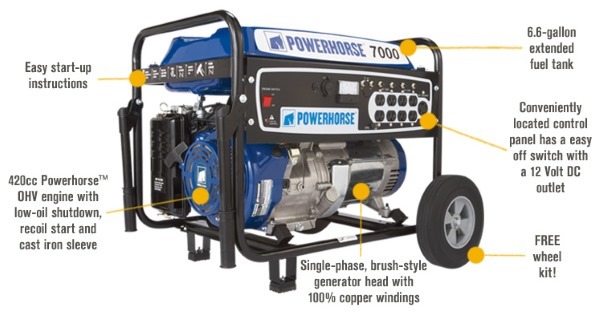 Read the full review of Portable PowerHorse 7000 Generator to know more below. 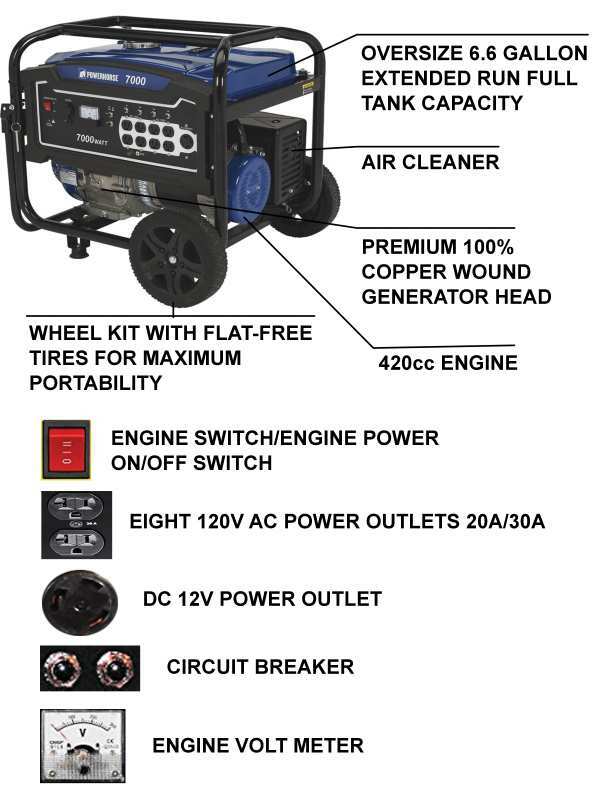 This Powerhorse 750140 Generator has an OHV engine of 420CC. It is equipped with a Cast Iron Sleeve. The Powerhorse Portable Generator will provide you 7000 Surge Watts with 5500 watts of continuous power. it has EPA Compliant that is the most benefit of others generator. Yes, You read it right. 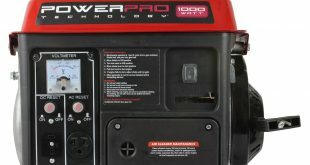 The Powerhorse brand has kept multiple outlets of different power specifications and types in this generator. There are two circuits to supply power. The circuits are of 23 Amp count. Each circuit will provide you with 250W power. To top it all, each of the two circuits has 23 Amp breaker and these breakers are ones with “Push-Reset” technology. There are both 120 Volts and 240 Volts Twist lock system to provide power to the appliances. There are as many as 8-5-20R outputs and one L-14 output for the 240 volt power. Even there is a 12 Amp DC Output and an 8 amp breaker installed in the generator. When you are looking at other generators in the market, this one loses out in terms of fuel capacity. It uses unleaded gasoline and has the tank which can accommodate 6.6 gallons of oil. When you consider the output, it can run for 9 ½ hours with the load of 50%. It is a noisy generator. You can hear 74 dB of sound from far away and expect 95dB of sound from close proximity. This is one of the pitfalls of this generator and quite a few people might find it very annoying indeed. The Range of power attracted my attention. It offers 5500 watts of power up to 7000 surge watts. The Powerhorse generator is reputed for the clean electricity it provides. It is safe for the equipment you use. The Engine contributes to the performance of the generator. 420CC OHV 4-stroke engine is really good. Strongly built body with cast iron sleeves ensures durability. The generator has “Never Go Flat” tires for smooth mobility. It has “Low Oil Shutdown” and a number of circuit breakers that protect the equipment. You can run a range of appliances with 10 outlets that Powerhorse 750140 portable Generator has. Although, it has wheels for mobility, the weight makes it hard to move the generator around. Loudness can be a concern for many customers like me. The generator doesn’t support electric start unlike many of its competitors. The low warranty for commercial users (90 days) is low. With the consumer warranty of 24 months this generator is generally good for home use. 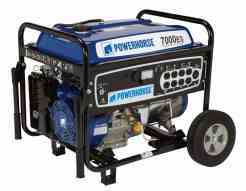 The price is also low for this range of Portable Powerhorse 7000 Generator. It is available for a modest price of $650. But it can require some extra money for shipping. 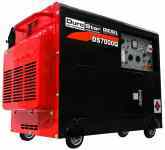 The generator can be maintained for a long period for use and it is indeed a good generator for private use so I think you can take this generator for the price point it is sold for.